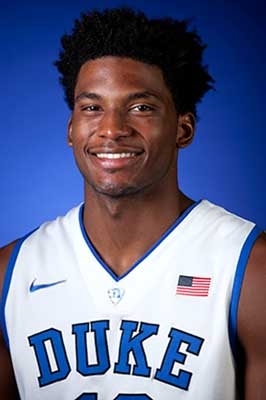 Winslow has an NBA-ready body with ideal size and strength out on the wing. His brawn, wingspan and athleticism give him supreme versatility, especially on the defensive end where he can guard several positions. His instincts on defense are fantastic, as he always seems to time shots to either block or contest them well. His physical tools make him a serious threat in the transition game. His ability to finish above the rim is as good as any wing prospect in this draft class. Effort is one thing coaches won't need to worry about with Winslow, seeing as he competes hard seemingly every play. He has a high motor and does a good job of staying under control. For someone his size, he also possesses a quick first step and is a nightmare for defenses when he attacks the rim in a straight line. If left open on the perimeter, he's capable of knocking down outside shots -- an area that has improved since his high school years. For someone with such a high competitive drive on the floor, Winslow is surprisingly even-keeled. He doesn't get too emotional and maintains his composure, even if his team is struggling. The lefty also has a high basketball IQ for someone so young and is constantly praised for being a great teammate. Although Winslow brings a solid skill set to the table, there's still plenty of room for growth. His overall offensive game still needs polishing, most notably his shooting mechanics. Improving the minute details of his jump shot would lead to far more consistent results from all different areas of the floor. Currently, he's a poor free throw shooter, but refinement of his mechanics could see his percentage climb. Like a lot of young players, Winslow needs to develop more overall consistency. There are times he steps up in big moments, and there are other times that he disappears. Some of this can be attributed to a lack of focus on certain plays. Most of the ups and downs are on the offensive side of the basketball. He's shown flashes of his passing ability, but improved ball-handling would help him better create offense for himself and his teammates. Winslow has upside, and fulfilling it hinges on his offensive development. And if he doesn't, he should still be a quality role player at the very least. He projects similarly to Wilson Chandler, who has tremendous physical tools for a wing, which allow him to defend at a high level. Both are streaky outside shooters that struggle to create offense but thrive in transition with their athleticism and ability to finish at the rim. If Winslow hits his ceiling, he should be a superior player to Chandler. Justise Winslow Full Highlights 2.21.2015 Vs. Clemson 20 Pts, 13 Rebs, 4 Stls, EURO STEP ON FIRE!! !